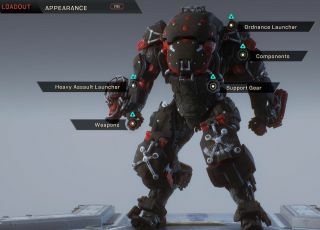 A guide for the best Colossus loadouts, builds, weapons, combos, and more in Anthem. The Colossus is the biggest and toughest Javelin you can pick near the start of the game. If you don't mind absorbing damage while charging onto the scene and knocking enemies aside, while also having some super powerful artillery attacks, this might be the one for you. Here are some Colossus tips to help you get the best out of this Javelin in Anthem, including Colossus build guides, best weapons and more. The Colossus is the heavy of Anthem. If you're looking for a more agile class, or want some elemental abilities, try the Interceptor or Storm. If you chose the Colossus, you're a tank, designed to take damage more than other classes. You'll get hit a lot, but you'll also be able to take it in most cases, and dish out some seriously big explosions alongside. The Colossus's melee attack is unusual in that it can hit multiple enemies at once, creating damage in a small radius. The higher up you are, the more damage you'll do when you land with this attack. Your shield will lessen damage, plus you can charge into enemies with it and use as a melee attack. You're like a chunky, mech version of Captain America. This makes you particularly useful for keeping fire off other squadmates on your expeditions. Siege Cannon: Probably the nicest feeling weapon in the Colossus's arsenal, unloading one explosive shell on top of an enemy. Harder to aim at flying enemies. Flamethrower: A short-range deadly fire attack that does decent damage over time. Flak Cannon: Like the above, but fires a bunch of shells at once. Looks nice and works well against a few enemies at a time, but not too useful against lone targets. Venom Spitter: Unleashes acid damage and comes with plenty of ammo at a time, but the range is naff, and it's a bit annoying to arc towards flying enemies. Railgun: This charges first before each shot, and will send an enemy flying backwards. Firewall Mortar Creates a wall of fire, and shows you where the wall will end up before firing. Useful if you want to keep enemies together, or keep unwanted foes away. High-Explosive Mortar Not dissimilar to the Siege Cannon discussed above, but when it comes to combos, it's no help. Lightning Coil Will automatically unload lightning attacks on an enemy, attacking up to ten enemies in a row. Is super useful in combo situations, but it's not the most exciting to use, and each individual hit feels a little weak. Burst Mortar In the ballpark of the flak cannon, offering more artillery-based damage. Shock Coil Probably our least favourite on this list—will just do lightning damage to anyone surrounding you. Lightning Coil is a little more useful. Shield Pulse Either support gear will do the trick here, but it really comes down to what sort of player you are. Shield Pulse grants 33% reduced damage to any teammates in the area when you activate this. Combos trigger area of effect damage in Anthem, so you'll always want to plan around that, no matter which Javelin you're playing as in the game. Ideally, you want to be carrying a primer and detonator weapon: reflected in the Forge's UI by a circle and star respectively. These are our two favourite loadouts with the game so far. Since the Lightning Coil fires automatically after its first use, setting fire to enemies and unleashing this offers a steady and solid combos. The Firewall Mortar keeps your foes in a tighter space so you can drop some Siege Cannon fire on them, which is cruel but effective way to take 'em out. The game's rifles feel like a weird match for the Colossus, which thrives at close range and is designed to charge into battle. We've found that the light machine guns and autocannons are a better fit for this particular Javelin—that'll help you take down loads of enemies at a time. As an alternate, consider the shotgun or the grenade launcher, which are both useful to switch between in a pinch. There are seemingly 10 Components specific to the Colossus in Anthem, alongside the ones that are available to all Javelins in the game. We've decided to just select a few that we've found handy while blowing through Anthem's campaign. Colossal Stock Augment is useful, and so is Colossal Storage Augment. You'll want the first one for adding a hefty 35% to your magazine size. The second, meanwhile, adds that same percentage to your overall ammo capacity. This means you'll be able to stay in the fight for longer, which is important for this heavy class. Some other Components we've found helpful: Explosives Expert will tack 15% onto your blast damage, so for any ability that results in an explosion—a lot in the case of the Colossus—this'll be super handy. It works for the Colossus's Ultimate, too. If you're more into using lightning and fire, think about using the Overclocked Regulator. It'll increase the damage of both by 35%. The Ultimate is a real treat for the Colossus: it unleashes missiles that cause enormous damage over a large area, with up to three fired at a time. You can fire it while flying, too, which is a useful way to clear out groups of weaker enemies. It'll probably make other people you're playing with go, "woah, that sure is a big explosion."